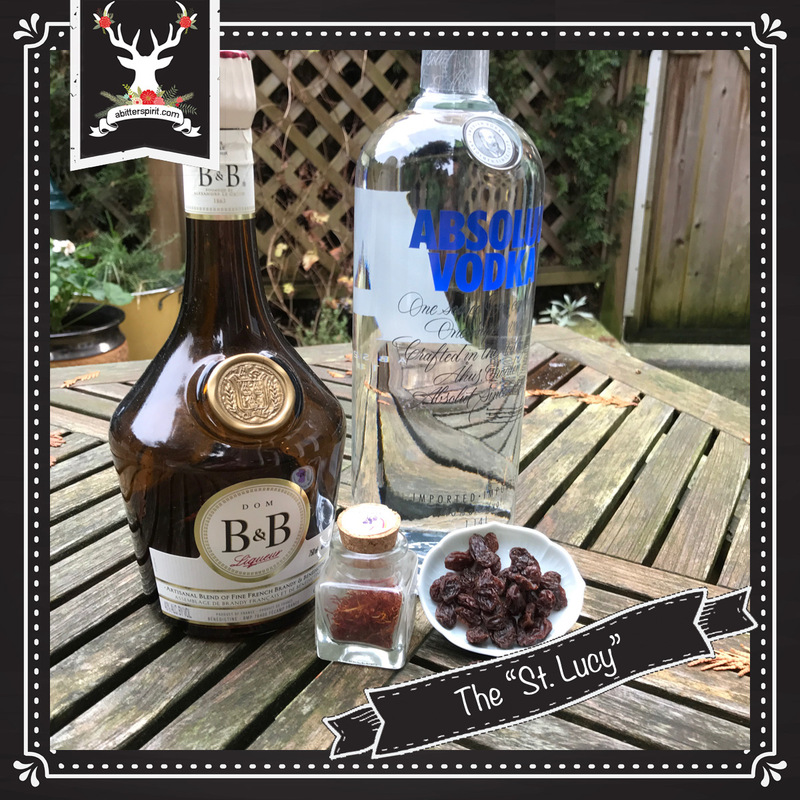 Continuing with Light Festivals, today's cocktail was inspired by St. Lucy's Day. Originally associated with the Winter Solstice before all those calendar redos, St. Lucy's Day is celebrated on December 13. Tradition holds that St. Lucy, wearing a candle-lit wreath, brought food into the catacombs to feed the refuges who were hiding there. Each year, the celebration of St. Lucy's Day, particular in Scandinavia, marks the beginning of Christmastide. One of the traditions on this holiday is the making (and, of course eating!) of saffron buns. These yeasty lussekatt are made with a little saffron bloomed in brandy and some raisins. To reflect this, we infused some vodka (Absolut for the Scandinavian connection) with saffron and raisins. To this infusion, we added some B & B to give some warmth, spice and sweetness. 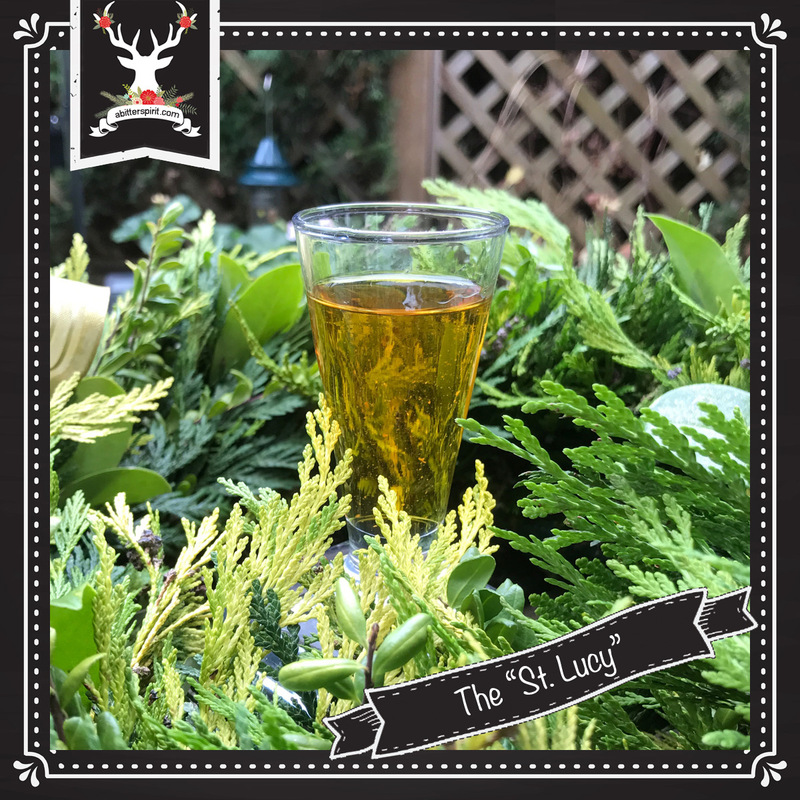 Instead of making it a full drink, we decided that a shot would A. be something different for our calendar and B. if we flamed it, it would be reflective of the candles on St. Lucy's wreath (Holy imagery, Batman!). We got the shot, but flamed out on the flaming as the vodka did not have a high enough proof! Ah well, still a fun festive drink to celebrate with. To make infusion: combine about 1/4 cup raisins and 2 tsp saffron strands with 1 cup of vodka. Let it sit for 2 days. To make cocktail: combine ingredients in shaker over ice. Pour into glass. If you want to make this a flaming shot, don't shake over ice. We thought about trying currants as well as raisins. But we didn't have any and we were running out of time. If you try it with currants, let us know how it goes!